This study investigated the effectiveness of a simple adaptive control system used for controlling the dynamics of the driving system of a wheeled mobile robot. This paper describes the design method of a speed control system and the gain adjustment procedure considering a practical application of the simple adaptive control system. Experiments were conducted on two different road conditions, and the results indicated that the rectilinear performance of the wheeled mobile robot improved with the use of the simple adaptive control system. In the case of uncertain road conditions, the simple adaptive control system reduced the deterioration of the control performance effectively. K. Terada, H. Miura, M. Okugawa, and Y. Kobayashi, “Adaptive Speed Control of Wheeled Mobile Robot on Uncertain Road Condition,” J. Robot. Mechatron., Vol.28, No.5, pp. 687-694, 2016. New Energy and Industrial Technology Development Organization, “2014 White Paper on Robotization of Industry, Business and Our Life,” 2014. S. Kitagawa, M. Kato, M. Okugawa, and Y. Kobayashi, “Attitude Angle Estimation and Vibration Control of Mobile Robot with Self-Righting Mechanism,” Proc. of the 11th Motion and Vibration Conference, Paper No.8728, 2012. 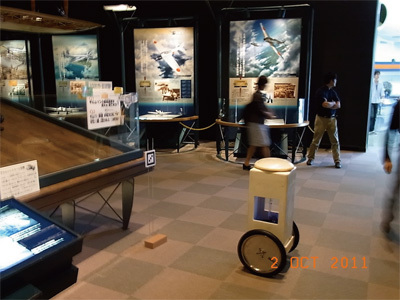 M. Okugawa, Y. Kato, M. Kato, and T. Ohmichi, “Showpiece Identification and Utterance Function of Tour Guide Robot,” Trans. of the 12th SICE System Integration Division Annual Conf. (SI2011), pp. 2164-2167, 2011. P. A. Ioannou and K. S. Tsakalis, “A Robust Direct Adaptive Controller,” IEEE Trans. Automatic Control, AC-31-11, pp. 1033-1043, 1986. H. Kaufman, I. Bar-kana, and K. Sobel, “Direct Adaptive Control Algorithms,” Springer, 1997. K. S. Narendra and A. M. Annaswamy, “Stable Adaptive Systems,” Dover Publications, 2005. Z. Iwai, “New Trend for the Practical Use of the Adaptive Control Simple Adaptive Control (SAC) Method,” Trans. of the Institute of System, Control and Information Engineers, Vol.37, No.5, pp. 9-15, 1993. S. Arata, “Adaptive Control and the Periphery,” J. of the Society of Instrument and Control Engineers, Vol.32, No.12, pp. 975-980, 1993. A. Matsumoto, H. Sogo, and T. Yamamoto, “Swing Control of a Variable-Length Pendulum Using Self-Tuning Regulator,” Trans. of the Japan Society of Mechanical Engineers, Vol.67, No.659, pp. 83-89, 2001. T. Yamamoto and M. Kamata, “A Design of Self-Tuning PID Controllers Based on the Generalized Minimum Variance Control Law,” Trans. of the Institute of System, Control and Information Engineers, Vol.11, No.1, pp. 1-9, 1998. I. Bar-kana, “Simple Adaptive Control of Uncertain Systems,” Int. J. of Adaptive Control and Signal Processing, Vol.2, pp. 133-143, 1988. I. Bar-kana, “Classical and Simple Adaptive Control for Nonminimum Phase Autopilot Design,” J. of Guidance Control and Dynamics, Vol.28, No.4, pp. 631-638, 2005. K. Kyoizumi, Y. Fujita, and Y. Ebihara, “Simple Adaptive Control Method with Automatic Tuning of PFC and Its Application to Positioning Control of a Pneumatic Servo System,” Trans. of the Institute of System, Control and Information Engineers, Vol.14, No.3, pp. 102-109, 2001. M. Hino, Z. Iwai, K. Fukushima, and R. Wakamiya, “An Active Vibration Control by means of a Simple adaptive Control Method,” Trans. of the Japan Society of Mechanical Engineers, Series C, Vol.58, No.548, pp. 40-46, 1992. K. Terada and M. Okugawa, “Speed Control with Adaptive Control System for Wheel Type Mobile Robot Considering Variation of Road Friction,” Trans. of Dynamics and Design Conf. 2014 (The Japan Society of Mechanical Engineers, Dynamics, Measurement and Control Division), Paper-No.731, 2014. Z. Iwai, A. Ohtomo, and I. Mizumoto, “Simplified Robust Adaptive Control Systems,” Trans. of the Society of Instrument and Control Engineers, Vol.27, No.3, pp. 306-313, 1991. Z. Iwai, I. Mizumoto, and H. Ohtsuka, “Simple Adaptive Control SAC,” Morikita Publishing, 2008.